Wobble-free carts are ideal for transporting tools and supplies. Heavy-gauge construction with 5" hard rubber casters that are welded to base. 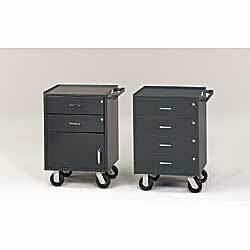 20"W x 19-3/4"D x 5"H drawers are keyed-alike and feature ball-bearing slides. 1/2" lip on 3 sides. Gray enamel finish and 800-lb. capacity. 23"W x 20"D x 34"H overall. Color: GY - Gray. IN STOCK. YL-0550GY Wt. 132 lbs. 2 Drawers and Cabinet. Gray	 23"W x 20"D x 34"H.
YL-0551GY Wt. 170 lbs. 4-Drawer Cart. Gray	 23"W x 20"D x 34"H.